Curb Your Enthusiasm: "Vow Of Silence"
Here’s something I’ve been wondering: would Curb Your Enthusiasm be as funny as it is if Larry David weren’t an extraordinarily wealthy man? Of course, it’s a moot point, and I'm sure Larry was funny long before Seinfeld. But I do think there's something about Larry's petty, entitled worldview that has become vital to his brand of comedy. If he were a janitor, or even a chemistry teacher, rather than the executive producer of one of the most successful TV shows of all time, would Curb be as great as he is? I doubt it. Part of what makes Larry so hilarious, at least in the context of Curb, is how infinitesimally tiny his problems are; it's the contrast between the volume of his moaning and the scale of the injustices he faces. Larry's enemies are the small-time evildoers of the world, the “pig parkers” and “chat-n’-cutters,” not the drug dealers or human traffickers. The conventional wisdom about comedians is that they are tortured souls who use comedy to cope with the pain of adversity, but Larry David provides solid evidence to the contrary: that extraordinary privilege and material comfort can actually make you pretty funny, too. But “pig parking” isn’t the only social injustice Larry rallied against tonight. In the dinner line at Susie and Jeff’s going-away party, he chides a woman for pulling a “chat n’ cut,” which he defines as “feigning familiarity with someone she vaguely knows with the sole purpose of cutting in line.” Part of Larry’s comedic genius is the way he identifies and brands these minor, everyday breaches of etiquette—and his willingness to confront those who perpetrate them, rather than stewing in silent resentment, as the rest of us would. The best part of his confrontation with the chat-n’-cutter is how quickly her “friend” turns on her. “We met once like 8 years ago…I feel a little manipulated here,” he confesses after the slightest interrogation from Larry. Larry’s other great challenge this week is to avoid participating in a field day benefit for “special needs” children organized by Tessler (yay, Michael McKean!). Larry begs off, claiming that he’s going to be in New York on the day of the event. Later, he runs into Tessler at Pinkberry. The event’s been rescheduled because of a bed bug infestation (can you blame Larry for not wanting to go?). At this point, most of us would have just sucked it up and gone, but Larry David is not most of us. Instead, he makes up another lie about being in New York for the next 2-3 months, working on a new project with Jerry. Tessler offers Larry a free place to stay while he’s in town —Renny Harlin’s apartment, no less. Either he’s the nicest guy in LA, or he’s calling Larry’s bluff in the most tactful way imaginable. Either way, Larry has no choice but to go to New York. It’s unclear what’s the bigger motivating factor: the possibility of losing face to Tessler, or of spending an afternoon with a bunch of “special needs” children. Can either option truly be any worse than a 6-hour flight with Susie? But the real source of drama in “Vow of Silence" is Pinkberry, the overpriced frozen dessert beloved by Angelenos with disposable incomes. Jeff and Susie have to put their dog, Oscar, to sleep. Distraught, Susie demands that Jeff and Larry go get Oscar a cup of Pinkberry—coconut, to be precise—for his last meal. It is, of course, a completely absurd request: what kind of rich idiot buys their dog $7 frozen yogurt? On the drive back, Larry begs to have a bite of the yogurt—“I’ve got low blood sugar,” he complains to Jeff. Then Jeff takes a bite to make it even, only it’s bigger than Larry’s, so Larry takes another bite. A few more rounds of this, and the Pinkberry is gone. In a panic, Jeff tells Susie Pinkberry was closed because of a Korean holiday. Their secret is safe until Vance breaks his vow of silence in an act of revenge against Larry. This is one of those Curb episodes that ties together perfectly, with no loose threads and just the right amount of endings. The last minute or two, in particular, have a wonderful, tight comedic rhythm: Vance rats on Larry; Susie declares how happy she’s going to be not to look at his face for three months; Larry holds up his pointer finger and says, “Ehhhhh….”. 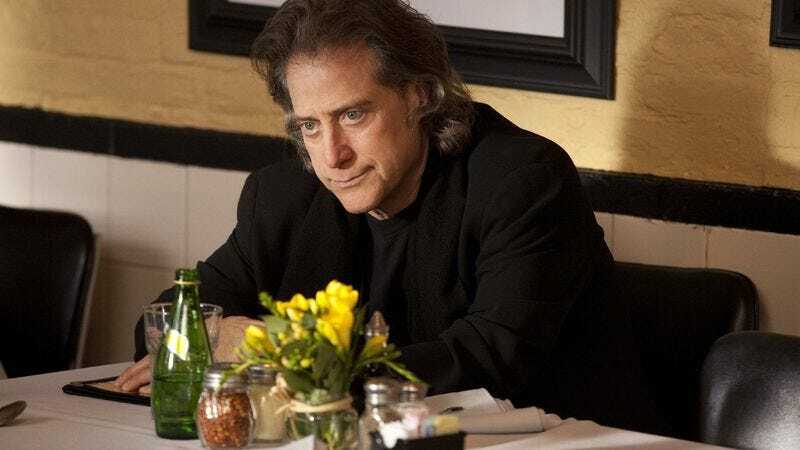 Cut to Larry, sitting next to Susie on the plane to New York and happily scarfing down a cup of Pinkberry, having forgotten his lunch date with Richard Lewis. Jeff: There’s a great Mexican place down the road. Larry: Yeah, I dunno. Not Mexican. Jeff: Sushi, sushi's fantastic, nice and light. Larry: I’m reading all this mercury stuff, I’m scared. I can't eat sushi. Jeff: How about some Italian. Want to get some pasta? Larry: I don't like to have hot food for lunch. Jeff: What about a peanut butter and jelly sandwich? Mercury in sushi? Carb consumption? Not wanting hot food for lunch? These are what’s known as high-class problems. In some ways, "Vow of Silence" plays almost like a parody of ridiculous, rich southern Californians, with their empty spiritual gestures, trendy frozen desserts and dog shivas. God bless them. “Vow of Silence” calls to mind “The Non-Fat Yogurt,” the classic Seinfeld episode. Do you think LD has a sweet tooth? Oscar, it seems like only yesterday Larry was getting Sammy drunk and trying to steal you back. How time flies. Vance’s “vow of silence” was hilariously well done, especially given how trifling most of the things Vance “mouthed” (or gestured) actually were—like the scene when he runs into Larry and Jeff on the corner, and he’s gesturing something to them about the toppings at Pinkberry. But seriously, just what was Vance saying? "I'm the world's fastest prep. I once did a Silver Spoons in 48 hours." "You've gone through enough today, you don't need to be looking at garbage." I love that Susie manages to incorporate bling (in this case, pink sequins) into her shiva outfit. The “Keegan’s Club” outing sounded increasingly more ridiculous and nightmarish every time Tessler talked about it: sack races, open-air naps, workshops. Another great detail: Keegan is described as “special needs,” but we never learn the exact nature of his developmental disability. It’s a great way to satirize the term, which is both unnecessarily vague and kind of silly. Something that Tessler and I have in common: we both primarily think of Renny Harlin as Geena Davis’s ex-husband. Does this mean Renny Harlin will make some guest appearances this season? Please say yes.